How Educators Can Avoid Professional Summer Slide | Gary G. Abud, Jr.
Teachers who disengage from professional learning throughout the summer might also find themselves experiencing a degree of slide when they return in the fall. Don’t worry, though. You are covered! I’m honored and thrilled to be part of a new startup project launching the week of Memorial Day 2015 that will serve as a source of easily-consumable and quickly-accessible professional learning for educators throughout the summer and beyond! It’s a new radio show that I’m co-hosting with the inspiring educator Steve Perkins, a Latin teacher from Indiana, and the 2014 Indiana Teacher of the Year. Easily-accessible, readily-actionable professional development in under 10 minutes! One word that describes every teacher today is “busy.” All teachers want to advance their craft, but they don’t always have the opportunity or time to do so. They need access to tried-and-true resources and ideas for their teaching that don’t take lots of time away from their practice. That’s why we are bringing some of the best ideas in education from around the country to you in ten minutes or less. We are tapping into the expertise of nationally-recognized teacher leaders from across the U.S. and its territories to inform listeners about the latest and greatest in teaching, leading, and learning from around the country. Each week you will find a new episode right here as one of the State Teachers of the Year shares ideas and practices that will inform and inspire you to think differently about education. But what’s more is that every episode will give you actionable strategies for mobilizing the ideas you hear right away. You’ll hear from teachers across the P-20 spectrum and from all regions of the U.S. From authentic assessment to competency-based education, this program will not only keep you up to speed on what’s happening around the country, but inspire you with new ideas that you can use in your career. Listen on BAM! Radio Network We are excited to partner with BAM! 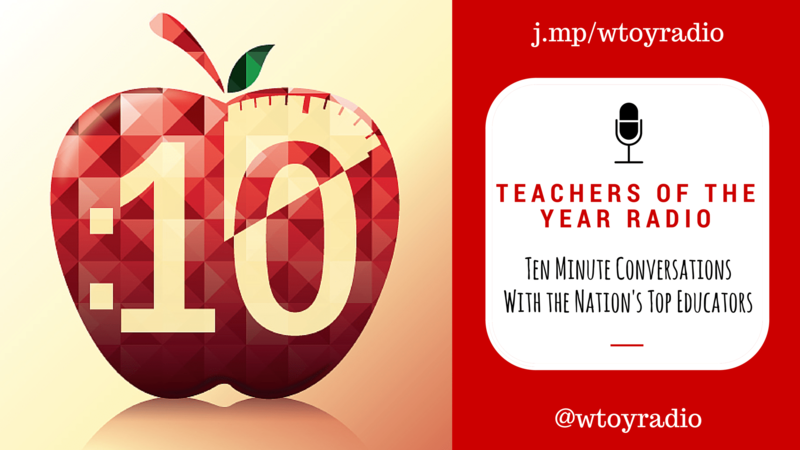 Radio Network to produce Teachers of the Year Radio. BAM! is “the largest education radio network in the world, offering programming from the nation’s top education organizations and thought leaders and reaching a wide audience of people passionately committed to quality education.” You can subscribe and listen to the program on the Teachers of the Year Radio channel on BAM! Radio Network.